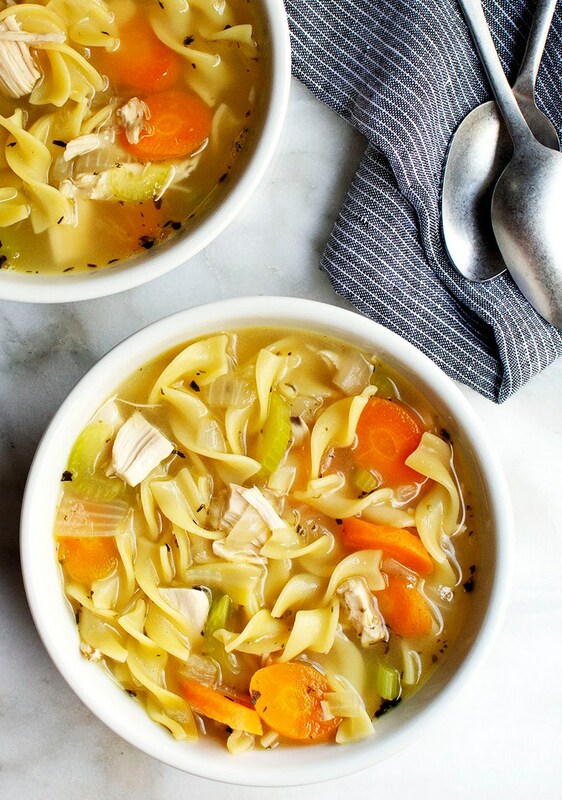 Homemade chicken broth is worth the extra effort, but your favorite canned or boxed chicken broth works just fine too. Melt butter in a 3-quart saucepan over medium heat. Add onion; cook and stir until softened and translucent, 3-5 minutes. Add celery, carrot, thyme, and broth. Bring to boil. Add egg noodles; cook and stir until nearly tender. Add chicken; cook and stir 2 minutes more. Season to taste with salt and freshly ground black pepper. Serve. I recommend making Homemade Chicken Broth or Slow Cooker Pulled Chicken (including the liquid) as the base of this recipe. If you'll be eating this soup over a few days, cook the noodles separately until nearly tender. Drain and rinse with cold water. Transfer to a lidded container and toss with a drizzle of olive oil to keep the noodles from sticking together. Refrigerate. Add cooked noodles to reheated soup for a minute or two before serving.